You may not realize that Lidia Bazanova (1864-1916) is worthy of your attention. There isn’t a damn thing about her in the English-language internet, and she is not included in John Milner’s wonderful Dictionary of Russian and Soviet Artists: 1420-1970. But as it turns out, even Russia chose to forget her for quite awhile. 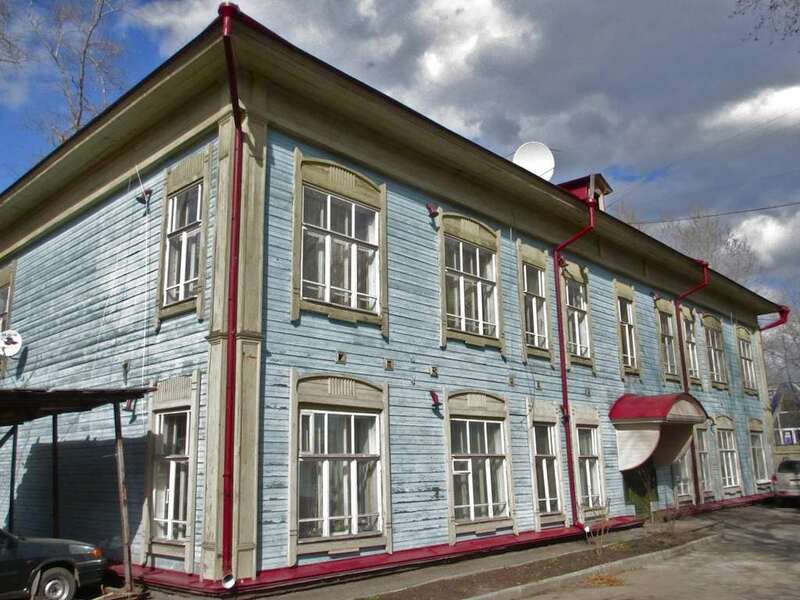 Here is what a major reassessment of her life and work had to say on the website of the Tomsk Regional Museum of Art: “The artist herself and her work were long forgotten; her creative biography was never published. 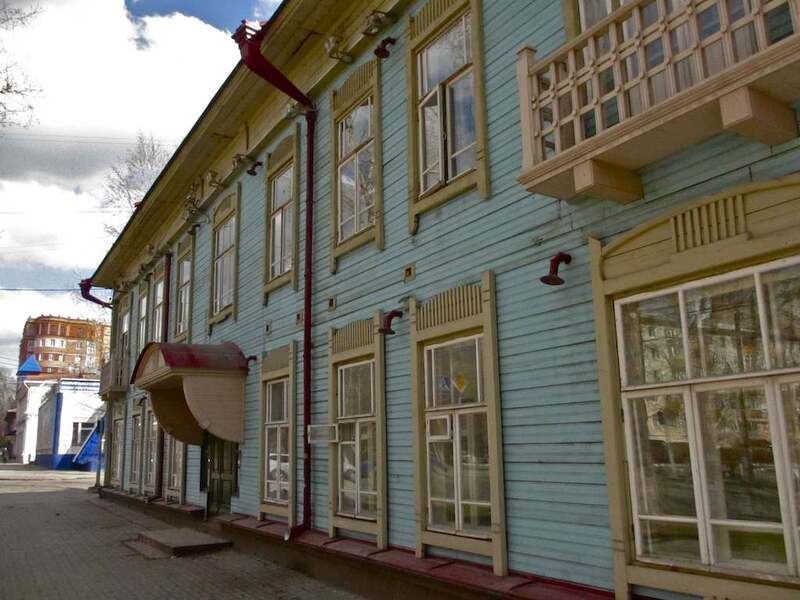 Tomsk residents recalled this interesting person and artist only in the 1990s when a few newspaper articles appeared.” I’m not the best person to crack the silence about her, because I virtually know nothing myself. But that doesn’t mean you can’t do a little hunting and reading and thinking, does it? 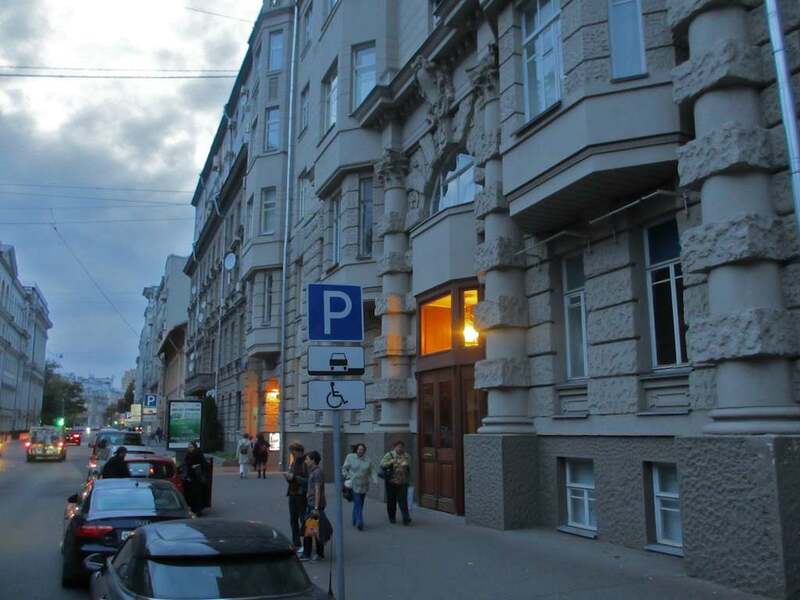 The building I show in this post is now called the Officer’s House (address: 50 Lenin Prospekt). 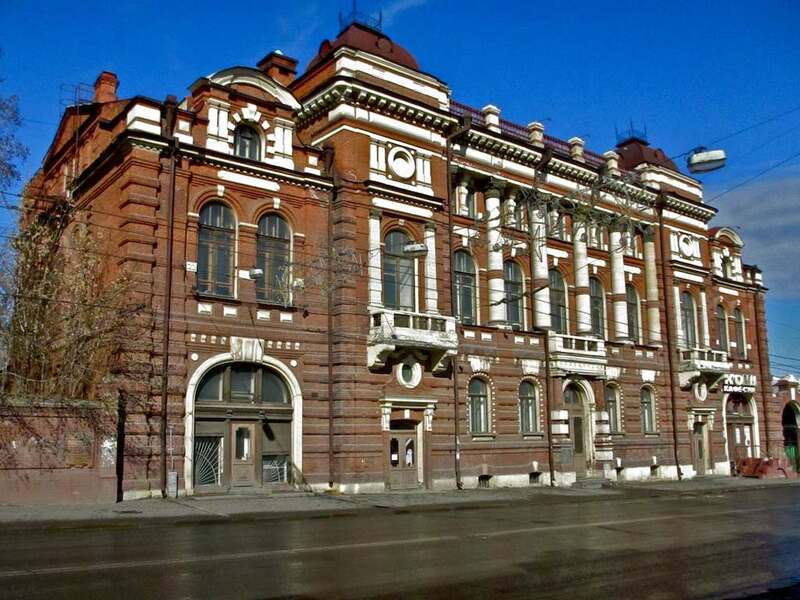 When Bazanova lived in Tomsk it was called the Public Meeting building and it was here that Bazanova not only organized her own first personal exhibit of paintings, but the first large art exhibit ever held in this city. That took place in 1902. I don’t know this for a fact, but I’m guessing that one of the paintings included in that exhibit was her Portrait of a Young Girl, which was painted in 1901. Because you’ll have a heck of a time finding that painting on the net anywhere, I am breaking my own little “rule” of showing only architecture and monuments and inserting the painting below as the last image in this post. You can see another of Bazanova’s best known paintings, Portrait of Grigory Nikolaevich Potanin (1915), on the museum.ru website. Note that you can increase the size of this electronic reproduction by clicking on the + magnifying glass icon in the upper left corner. 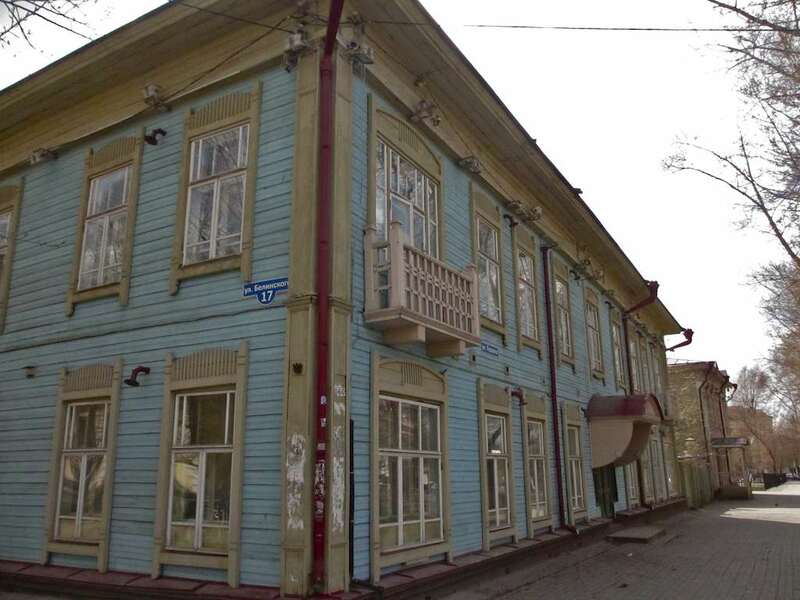 If you’re interested in more about Potanin and Tomsk, see the post I made on this blog-site in August. 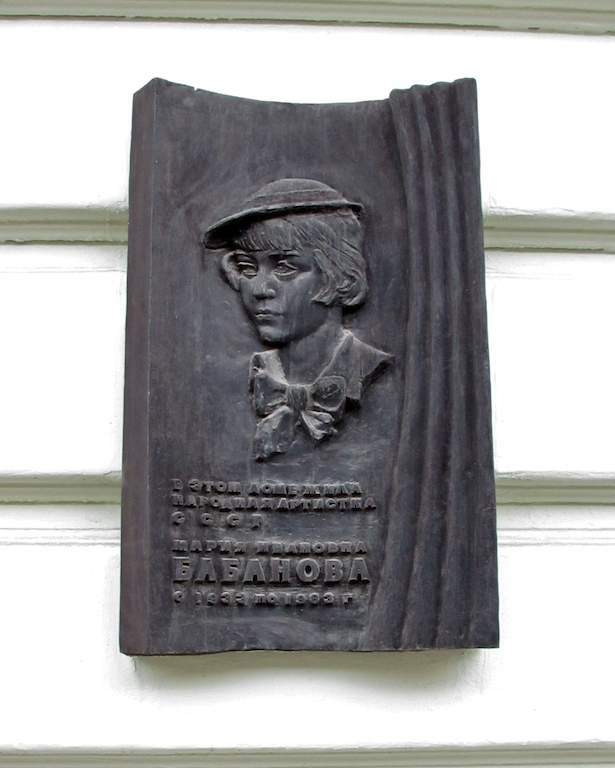 Bazanova was born Lidia Pupareva in Sernovodsk in the Samara gubernia and she died in Kazan. She graduated from the Moscow Institute of Sculpture and Architecture in 1895, following her husband Ivan Bazanov to Tomsk in 1899 or 1900, depending upon the source. 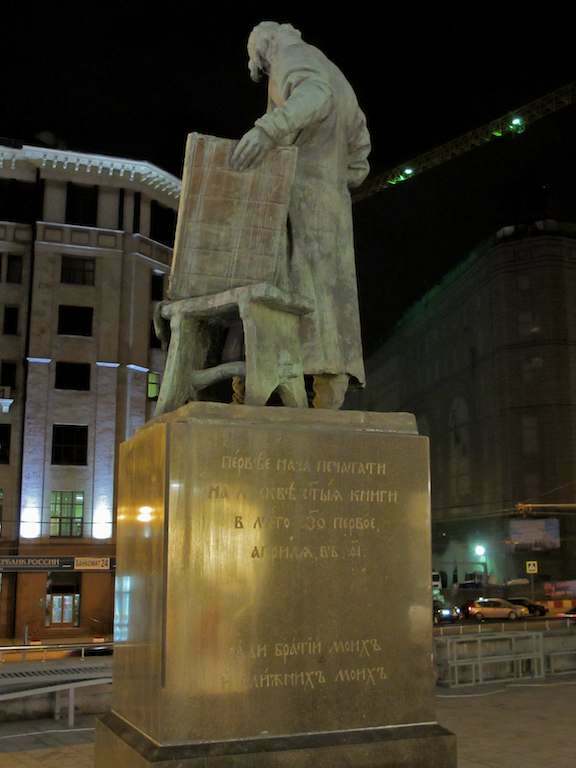 Ivan Bazanov was a professor of civil law and ship building (that’s what Russian Wikipedia tells us) until 1913. He was rector of the university from 1909-1913. The couple moved to Kazan in 1913. 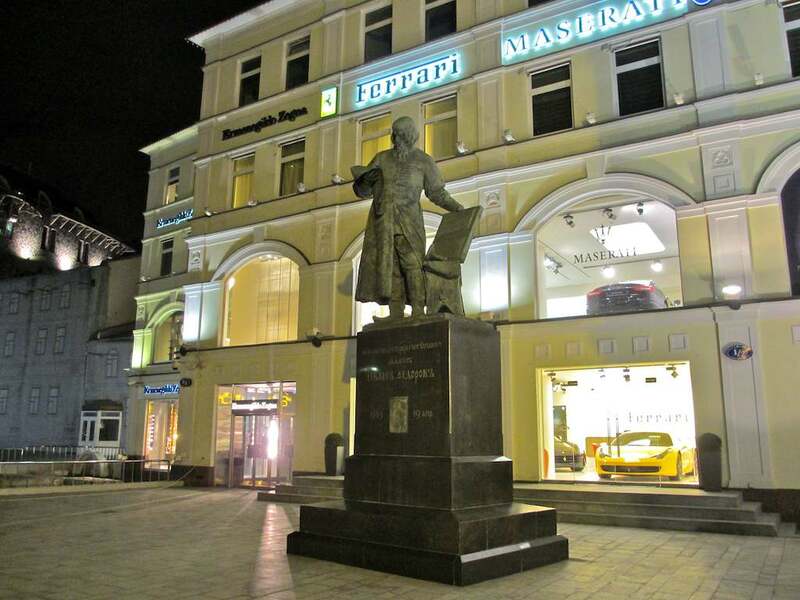 Bazanova not only painted, she was an instrumental figure in organizing art exhibits in Tomsk. She also was a well-regarded art critic and a teacher of art and painting. She stood behind the first Siberian Mobile Art Exhibit in 1903, an exhibit of French artists in Tomsk in 1904, and numerous exhibits of the Tomsk Society of Appreciators of Art from 1908 to 1909. 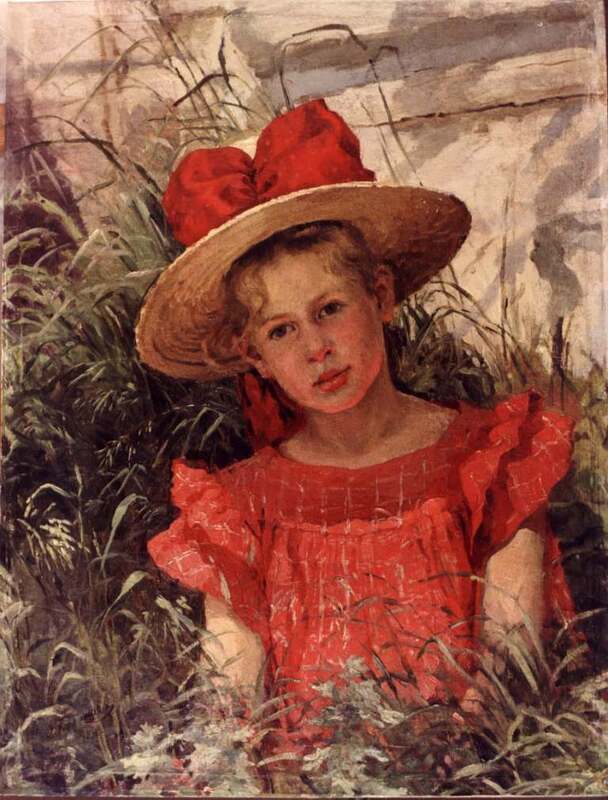 She participated in an international exhibit of fine arts in Rome in 1911 and her paintings were exhibited in various Moscow shows. I have drawn much of this information from the internet Encyclopedia of Siberia. If you’re the kind of person who likes to avoid the obvious, it’s rather difficult to write briefly about Ilya Erenburg (1891-1967). The fact of the matter is this: his most enduring contribution to Russian culture and literature is that his novella The Thaw (1954) gave one of the Soviet Union’s most important eras its name. The novel itself, like so many Soviet novels, is pretty close to unreadable these days. Its formulaic characters and situations are served up as literary Functions, with a capital F, and there is very little life or air to be found in the story. But whenever we discuss the post-Stalin Thaw, or the Khrushchev Thaw, we are doing so, lexically speaking, thanks to Erenburg. In fact, the man was a fascinating figure. Being revolution-minded early in his life, he spent time in prison as a political prisoner in 1908, after which he left for Paris. There he began his literary life as a poet and a newspaper correspondent. He returned to Moscow in 1917, but, unhappy with the turn that the Revolution took, he headed back to his beloved France. He remained in Europe as a news correspondent until 1940, when he returned to the Soviet Union and became one of the country’s most beloved and respected war correspondents. While in Europe, Erenburg wrote extensively, and with understanding, about avant-garde art, doing a good job of informing Europe about the Soviet Union and keeping the Soviet Union up-to-date about European art. During the 1930s he traveled back to the U.S.S.R. on short trips that allowed him to collect material for his creative writing. 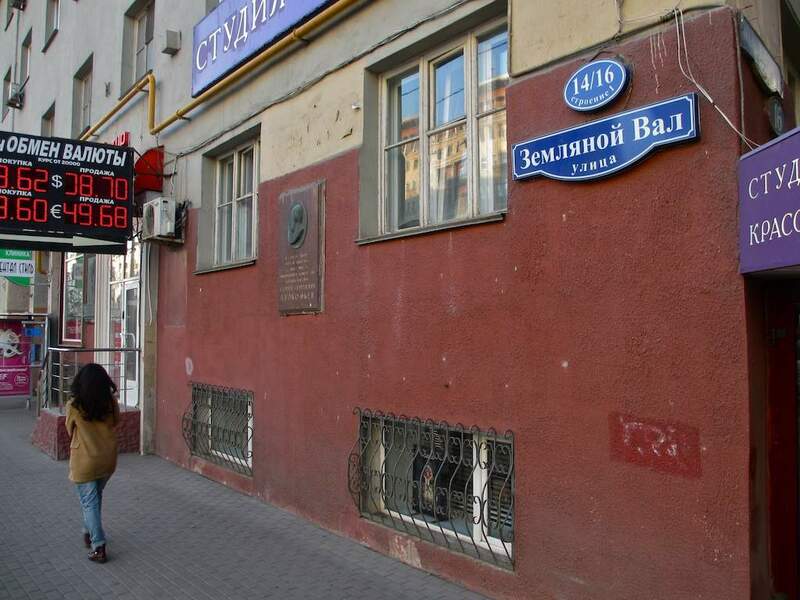 One of those trips in 1932 brought him temporarily to Tomsk, where he occupied an apartment in a simple, but attractive wooden building bearing the addresses of 11 Herzen Street, and 17 Belinsky Street. 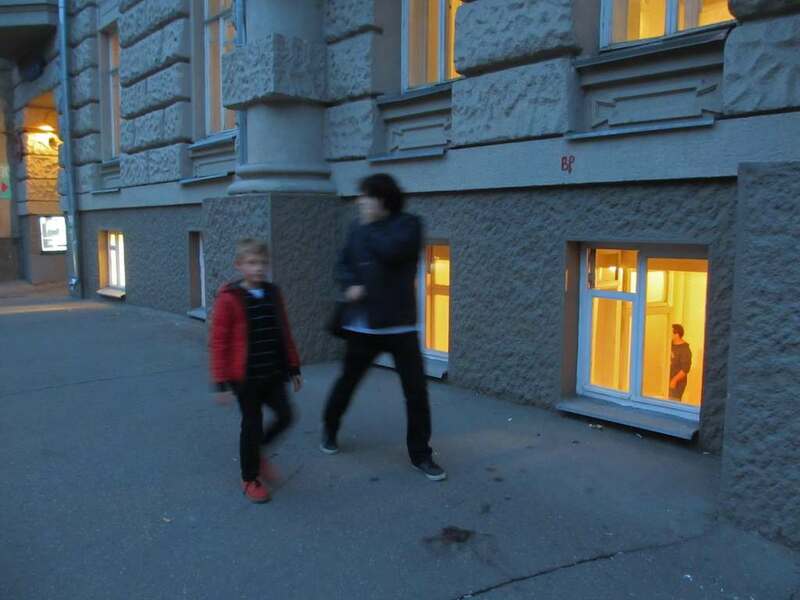 The first two photos here show the building from the street, while the last two photos show it from the courtyard, which, according to my friend and Tomsk expert Pavel Rachkovsky, is probably where the writer would have entered and exited the building. Erenburg’s legacy is mixed. 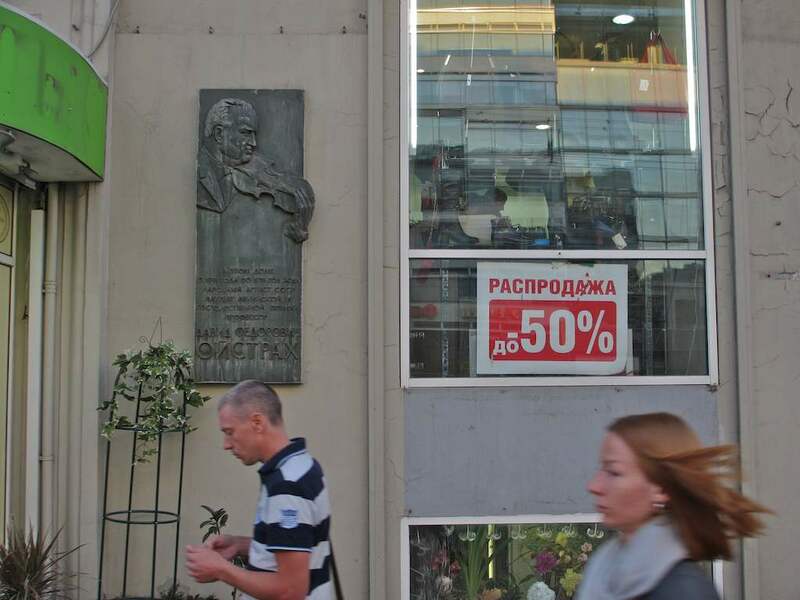 There is a great deal of suspicion in so-called “liberal circles” about how he was able to live in and travel freely to and from Europe while the vast majority of Soviet citizens were unable to leave the country. There are questions on the side of orthodox Soviet thinkers about what he was doing abroad all that time. In sum, if you are so inclined, you can find enemies and detractors of Erenburg on all sides. In that sense he remains a rather quintessential Soviet figure, steeped in mystery and suspicion, and not lacking in talent. In her classic book Babanova, the respected Russian critic and writer Maya Turovskaya wrote about Maria Babanova: “There are good actors, very good actors and splendid actors. And then there are uncommon actors – this word defines, it does not praise – and Maria Ivanovna Babanova was one of them. The Russian stage has not known such a unique actress before or since.” Babanova (1900-1983) achieved lasting fame working for a few years with Vsevolod Meyerhold. It is pretty much common knowledge that she was the perfect actor for him, physically agile, smart, able to do several things at once. She performed brilliantly in the lead role of Stella in the master’s famous production of The Magnanimous Cuckold (1922) and, as the saying goes, she woke up the next morning famous. She played in Meyerhold’s next production, Ostrovsky’s Profitable Post (1923) at the Theater of the Revolution, again drawing the highest praise. But things were not to be so easy for the actress. Before long, without wishing it, she found herself in competition with Meyerhold’s wife Zinaida Raikh, who had been installed as Meyerhold’s leading lady in life and profession. By 1927 Babanova realized she had no hopes of realizing her full potential with Meyerhold and left to join the troupe at the Theater of the Revolution (later to be called the Mayakovsky Theater). There she performed until 1975. She took the stage one more time as an invited actress in Oleg Yefremov’s production of Edward Albee’s All Over (1979) for the Moscow Art Theater. Aside from her work with Meyerhold, Babanova’s most famous individual role was probably the title role of Alexei Arbuzov’s enduring hit Tanya (1939). There was seemingly work enough for her over the years – she performed in 23 shows over a 52-year period at the Mayakovsky. But you see the nagging discrepancy. No matter how you do the arithmetic, it still comes out to less than one show every two seasons. That is hardly a full card for an actress considered one of the greatest of her generation. 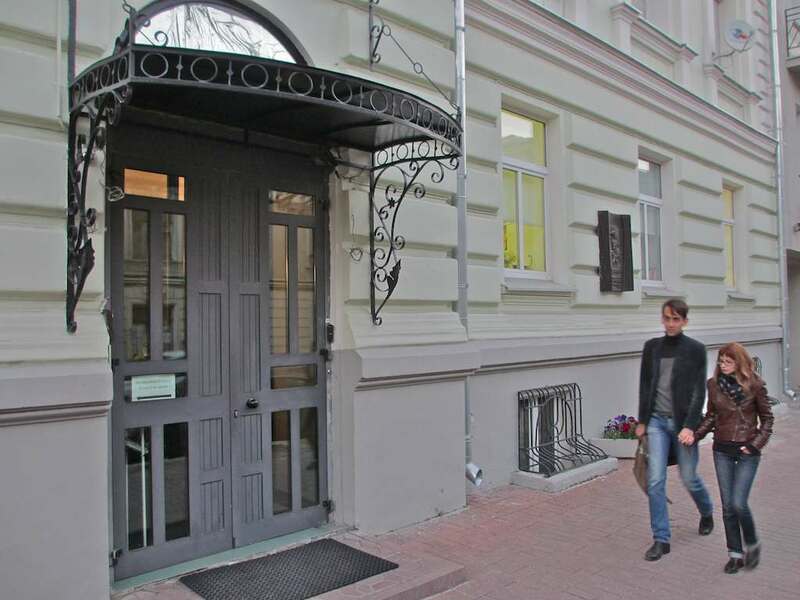 The gorgeous green building at 5 Petrovsky Lane, about two stones’ throw from Pushkin Square, was Babanova’s home for most of her career. She moved in here in 1933 and remained until her death 50 years later. 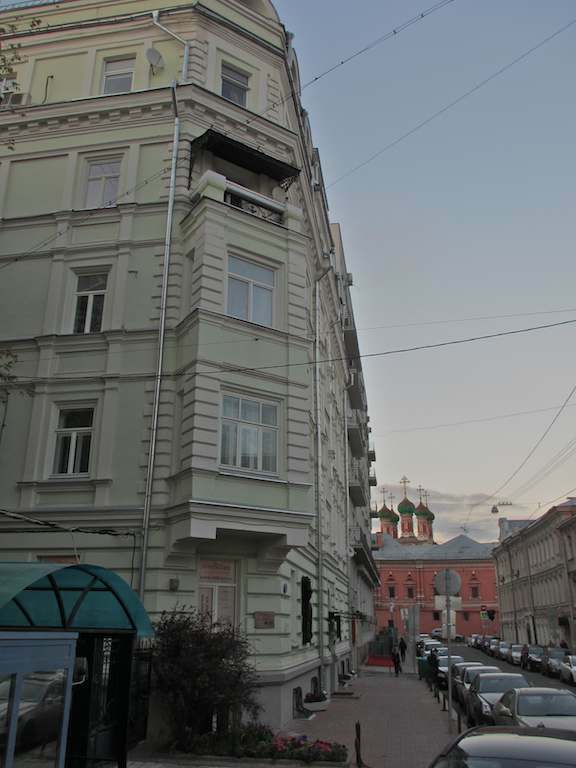 It is located next to the theater she would have known as the Korsh Theater or the Second Moscow Art Theater (and these days is called the Theater of Nations), while at the end of the lane one sees the cupolas of the Vysoko-Petrovsky Monastery. My wife Oksana loves to tell a story that she heard from her director Boris Lvov-Anokhin many years ago. Lvov-Anokhin was a friend of Babanova’s in the last decades of her life and spent much time with her, listening to her tales of old. One was one of those stories that any actor can use as a hard lesson in the profession. It goes this way: Babanova one day was rehearsing a second-rate play with a second-rate director. He was attempting to find out if the actress had done her “homework” and had given sufficient thought to all those Stanislavskian things – physical and emotional memory and such. So when it came time for the actress to walk out on stage, she did so. And the director, thinking something was missing and attempting to help her, stopped the rehearsal and asked, “What are you coming out on stage with?” He was probably hoping to hear some elaborate, imagined and long-suppressed tale of childhood tragedy. Babanova, probably thinking of long-ago rehearsals with Meyerhold, whom she loved and admired unquestioningly to the end of her days, looked at her director and said, “My purse,” and turned around and left the stage. One of the stories that Babanova told Lvov-Anokhin and which, in turn, filtered down to me by way of Oksana, involved the actress’s work with Meyerhold. He never “interpreted” actors’ roles for them and never gave them silly goals to work on. Meyerhold would provide what Babanova called a “geographical and rhythmic outline (partitura)” that clearly marked out the boundaries of a scene. Meyerhold would tell her, for instance, to run quickly down some stairs, stop, pause and look around, then continue to slowly descend before turning and racing back up the stairs. By doing what the director asked for, according to Babanova, the necessary emotions and intonations of the role followed automatically. Babanova had a unique, high-pitched voice that was often compared to a bell ringing. You can hear a recording of her singing a bit and then delivering a monologue from Tanya on YouTube. 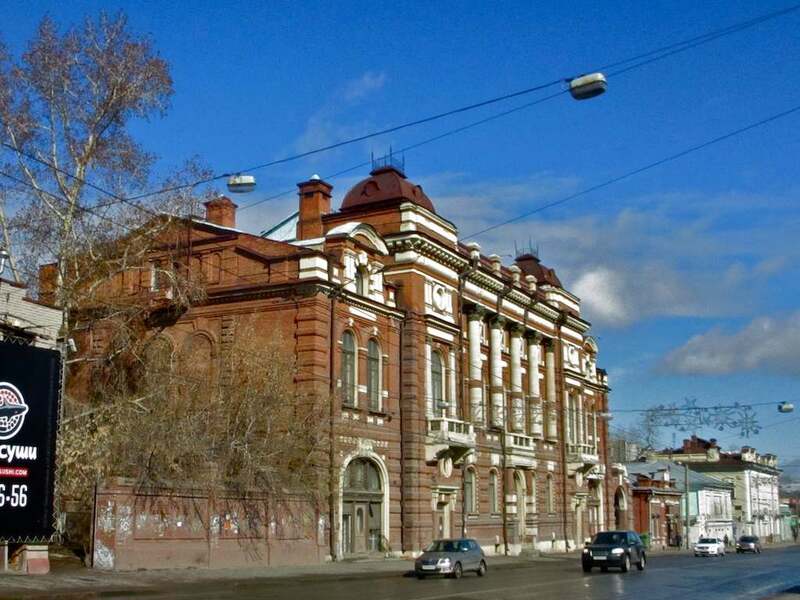 There’s a rich history of theater studios on Povarskaya Street. 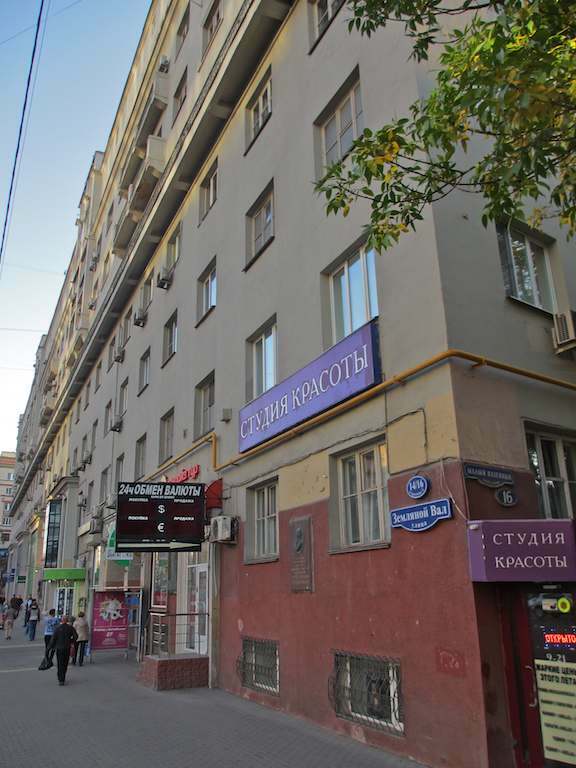 Chances are many readers of this blog know that Anatoly Vasilyev and his School of Dramatic Art occupied the building at 20 Povarskaya from the late 1980s to the mid-2000s. 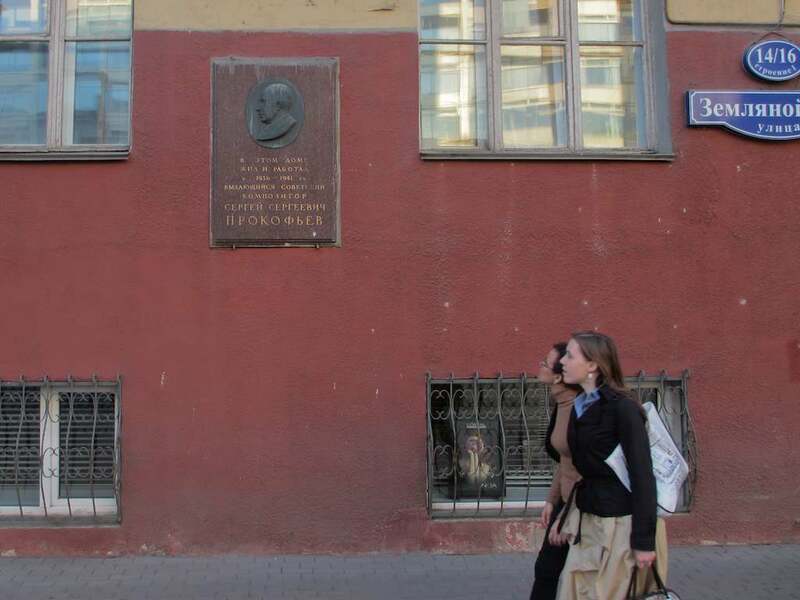 Some may also know that Vsevolod Meyerhold had a studio on the corner of Povarskaya and Merzlyakovsky Lane for half of 1905. That building was destroyed by bombs during World War II. But there was another studio here for much of the 1990s and that’s the one I have in mind – Gennady Abramov’s Class of Expressive Plastic Movement. 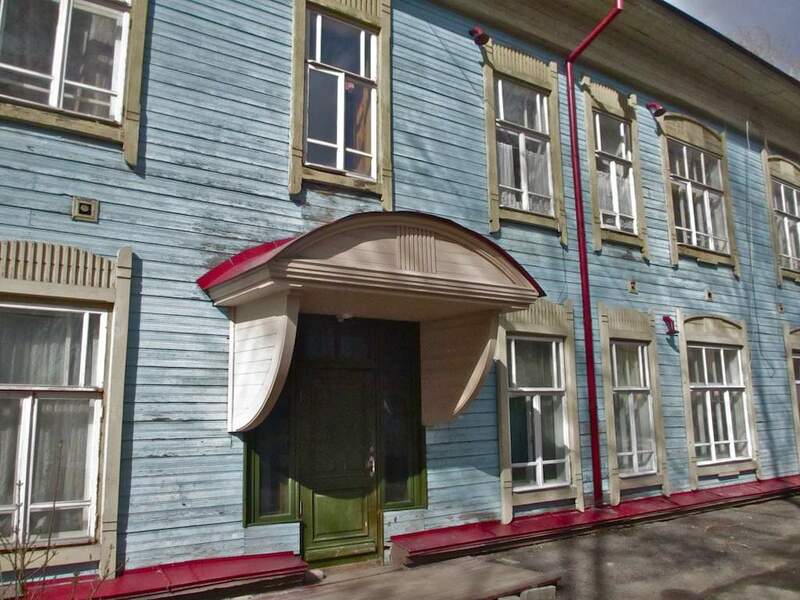 Yes, this was technically part of Vasilyev’s School of Dramatic Art, but artistically speaking it evolved into an independent entity that took on a life of its own. The success of that life determined its death – Vasilyev was unhappy with the wild popularity that Abramov and his students achieved and he pulled the plug on them, closing the studio just as it was accomplishing some of its greatest work. Abramov was a former ballet soloist and a choreographer who worked with Vasilyev for years, answering for the movement aspects of some of Vasilyev’s most famous productions, including A Young Man’s Grown-Up Daughter, Cerceau and Six Characters in Search of an Author. They first collaborated in the mid-1970s when Abramov choreographed Vasilyev’s production of – yes – Hello, Dolly! The idea of the Class of Expressive Plastic Movement was to help Vasilyev’s young actors learn what to do with their body when they were and were not talking on stage. You laugh, but stand on stage sometime and then start thinking – “What do I do with my hands? My feet?” It’s enough to drive a sane man batty. So that was Abramov’s job – to keep Vasilyev’s actors sane and teach them how to live in harmony with their bodies on stage. But it quickly became something else – it became a theater in its own right, with a separate audience, rave reviews, European tours and all the fame and pressure that go with that. For the most part, Abramov and his students weathered the test. Vasilyev, who wasn’t doing much of interest in those years, was less successful at handling his “employee’s” success. He brought down the hammer. In my more than 25 years of theater-going in Moscow, I know few phenomena that can match that of the Class of Expressive Plastic Movement. It was electric charged. It had the feel of something truly new and exciting. It was smart and witty. It was an elite experience, but in an utterly down-to-earth, democratic way. The people in it were talented and cool. Spectators jostled to get in and get a seat, often next to some admiring Western luminary – say, Pina Bausch – who was making the pilgrimage to find out what all the talk was about. Abramov always played the role of the self-effacing, unimportant, random guy in the house. “Me? I have nothing to do with it. It’s all my students. They do the work. I just let them out on stage.” Their shows consisted usually of 10 to 14 sketches, non-verbal, physical performances that were sometimes entirely abstract, sometimes were based on obvious plots – meeting, engaging, parting and the such. Abramov’s physical training helped his young actors achieve a prowess I had never seen before in Russia. These men and women could do amazing things. 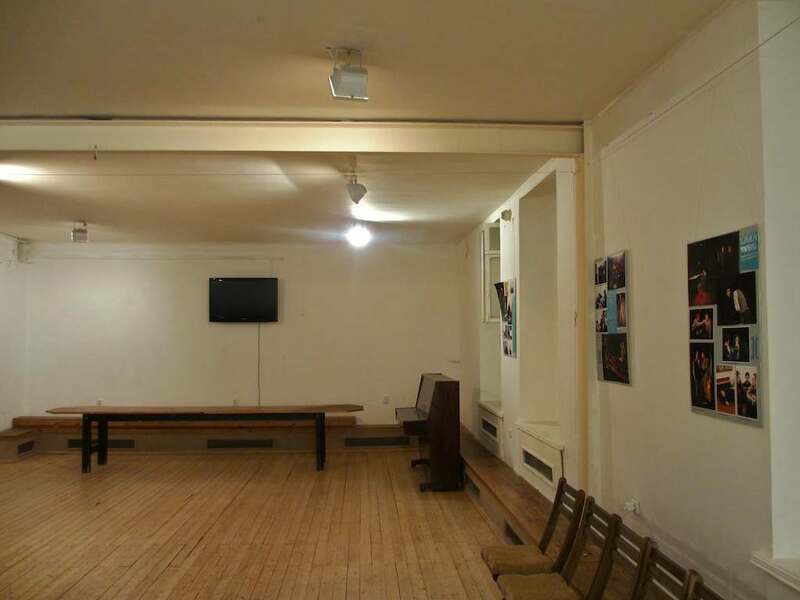 Take a look at the last picture in this small gallery and imagine Vladimir Belyaikin or Vasily Yushchenko, wearing nothing but a bit of a cloth wrapped around their loins, shimmying up the metal brace in the right-hand wall, then climbing, hanging, twisting and twirling their way all the way across the ceiling on the metal ceiling beam, and then down the other side. It was damned astonishing. Belyaikin and Yushchenko, like all the other performers in their own skits, did it as though they were bits of down wafted on a lazy breeze. 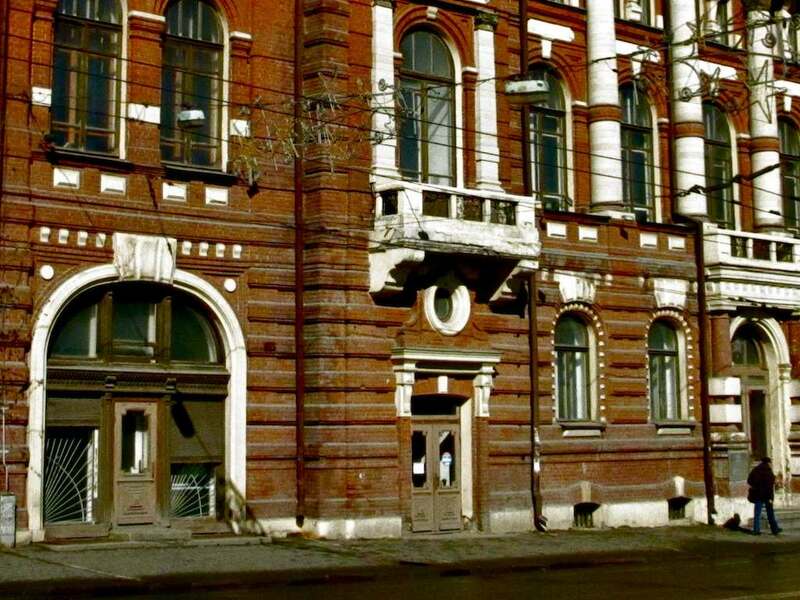 Until the big success hit and the tours began, the performances of the Class of Expressive Plastic Movement always took place in one of the basement studios at 20 Povarskaya Street. We spectators would enter through a door in the building’s archway that led to a courtyard in back. You’d walk down the stairs and at the landing below everyone would kick off their shoes. There were a minimum of 100 shoes strewn in a huge pile for every show. I don’t ever remember having trouble finding my own two in the madhouse that reigned around that pile after shows. 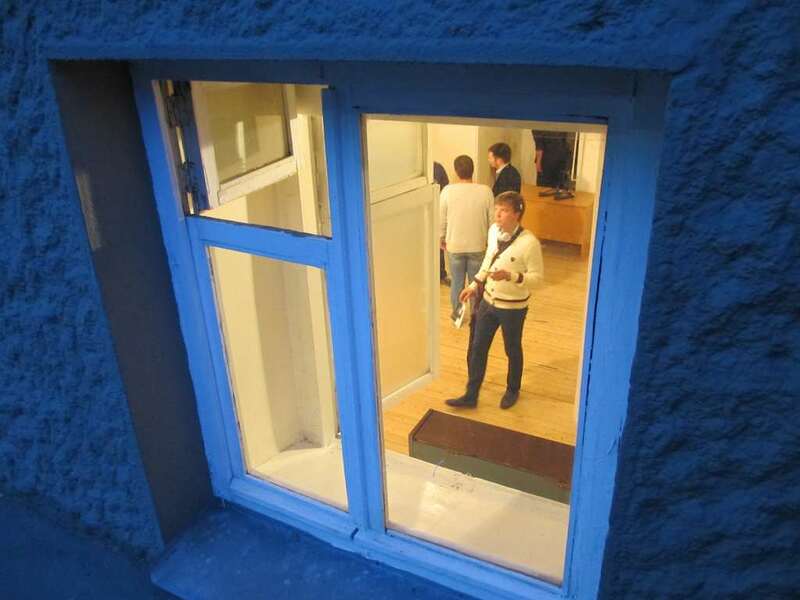 From the outside the basement studio still looks deceptively like it did back then. It has the same hardwood floors and the same white walls that catch your eye as you approach the entrance from the street. 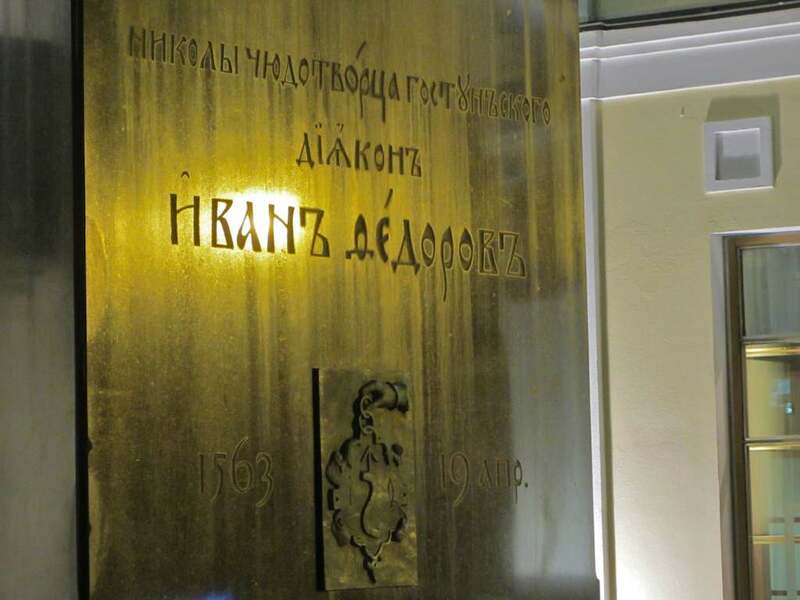 Regardless of what I am going to see at this theater these days, I have never once walked past those basement windows without peering into them, almost hoping against hope that I will see Abramov and his students back at work again. A large number of Abramov’s students went on to impressive careers as dancers, choreographers and movement gurus in their own right. A whole team of them left to tour for several years with Sasha Waltz. It’s interesting, and important, to keep in mind that Abramov’s work came and went before the boom in Russian contemporary dance occurred. It will take someone else with a deeper knowledge of the topic than I to make the definitive statement, but this I know: if Abramov did not kick off the flourishing of Russian contemporary dance, he surely set the stage for it. If you’re interested in learning more about Abramov and his work – and you should be if you’re interested in Russian theater – you can find several things I have written over the years. 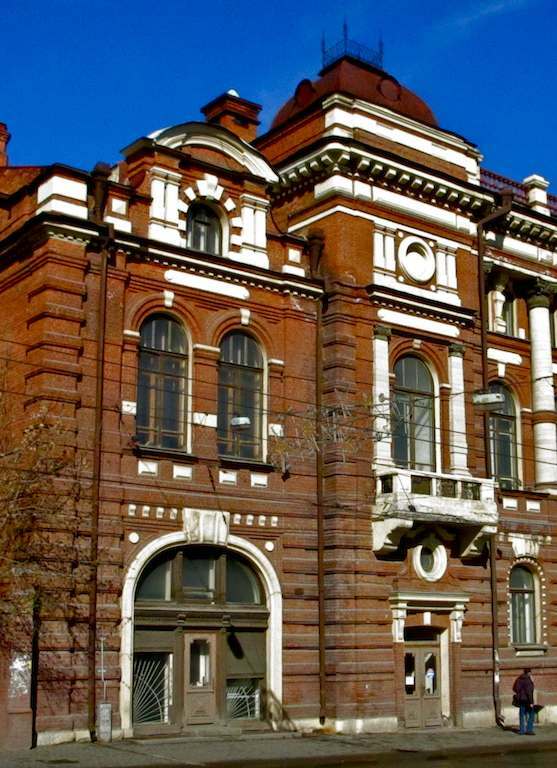 Perhaps the most accessible is a feature I originally wrote for Slavic and East European Performance and which I republished in my book Moscow Performances: The New Russian Theater 1991-1996. I also wrote about Abramov a lot in the pages of The Moscow Times. You can check the index there for those pieces. I was talking to my mother-in-law Lidia Grigoryevna Mysina-Bratus a couple of days ago. My wife Oksana, as usual, was doing her damndest to be the last living thing to leave the theater where she had just played a new show. I sometimes wonder if she sits in dark corners with the mice and dares them to leave before she does. But I digress. The point is that Lidia Grigoryevna and I were left sitting alone in a large, open dressing room for several hours. And we talked. Now, to be honest, Lidia Grigoryevna talked and I listened. She is currently working on her third book and one of the ways she writes is to talk and talk about what she wants to write, and when she hones the stories down to where they sound really nice and good, she then sits down and puts pen to paper. So one might say I was on the receiving end of a first draft of Lidia Grigoryevna’s next book, her first reader, so to speak. What the hell does this have to do with David Oistrakh, you ask? Everything. Let me turn the story over to Lidia Grigoryevna. Now, you see, when I first met my future wife Oksana Mysina, one of the first things I heard about was David Oistrakh. (And please pronounce it “dah-VEED OI-strakh,” or it will sound all wrong.) 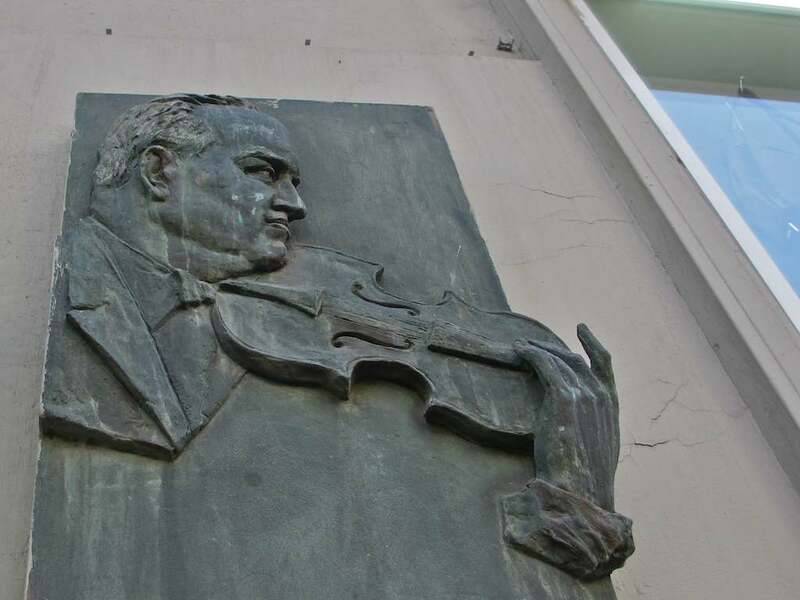 Oksana and her older sister Marina grew up in Donbass, Ukraine, listening to Oistrakh and they learned to play the viola (Marina) and the violin (Oksana) by playing along with Oistrakh records. You might say it was the Russian version of Bob Dylan playing along with Little Richard records in Hibbing, MN. Oistrakh is a god in the Mysina household. One of the great family events occurred when Oksana and Marina’s parents travelled to Moscow on business and came home with an album of David and his son Igor performing concertos for two violins by Bach and Vivaldi. That record had its grooves worn out by the Mysina girls as they learned to play those pieces. Oksana said the beauty of the music would make the whole family weep and laugh with joy. When Marina, an accomplished viola player who has her own quartet in Madrid, Spain, these days, comes home to visit, not a single evening can pass without someone bringing up Oistrakh and how the girls cut their teeth on his genius. I love hearing anyone in the family pronounce the name – Oi-strakh! There is wonder and reverence and a deep tribal closeness in the way they toss it off – Oi-strakh! And how about this for an incongruous story of how deeply David Oistrakh reaches into the fabric of Russian society: When in the early 1980s the KGB was chasing me around Washington, D.C., the agent whose job it was to befriend me often talked of hearing and even once meeting Oistrakh. These were important markers in his life. He spoke of the violinist with that same reverence I would later hear from my wife and her family. 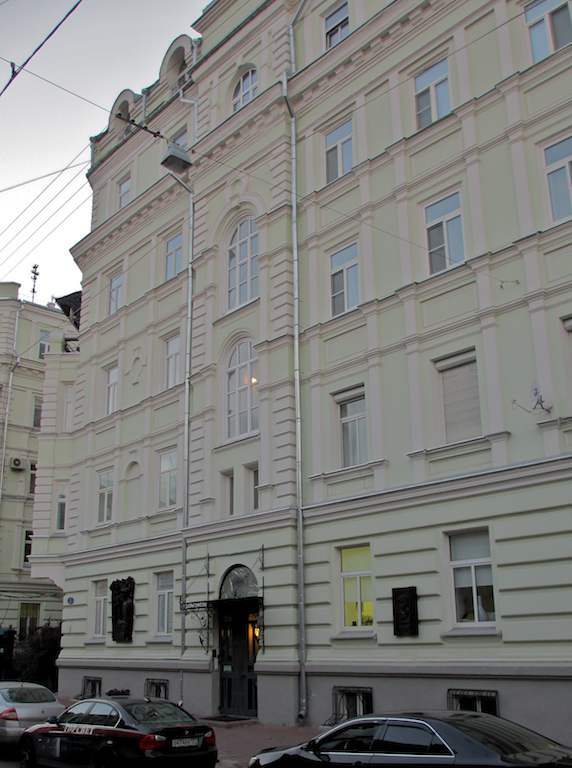 David Oistrakh (1908-1974) lived in this building at 14 Zemlyanoi Val Street from 1941 until his death. 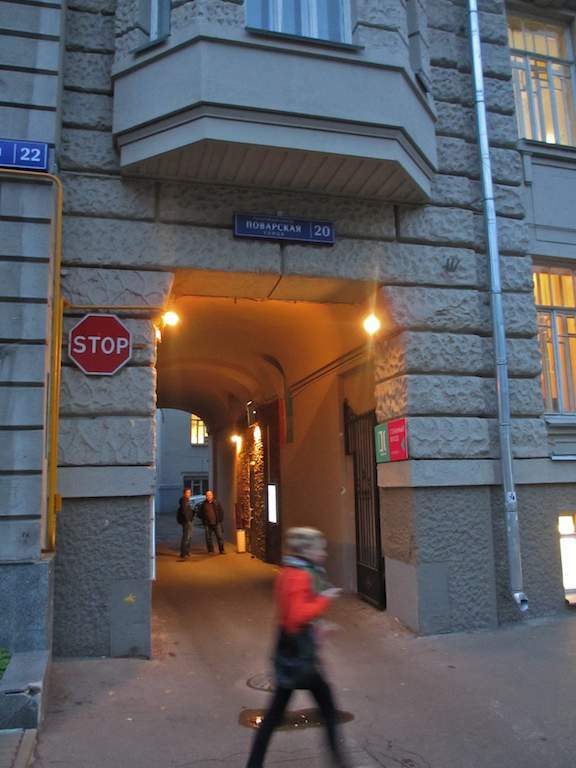 Attentive readers will recall from yesterday’s post that Sergei Prokofiev lived at this same address, but moved out just as Oistrakh moved in. There are names that are more than mere names. They are worlds unto themselves. For me Sergei Prokofiev (1891-1953) is one of them. 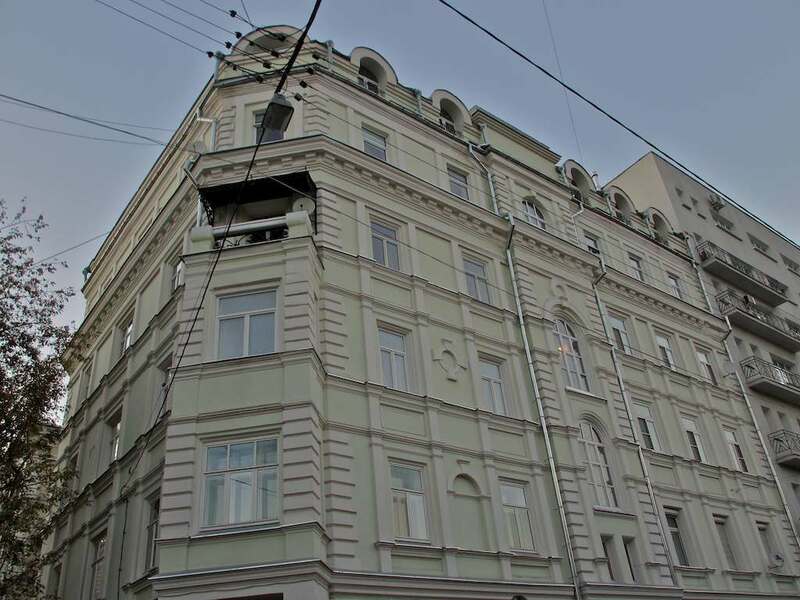 All the stranger, then, to walk past the building at 14/16 Zemlyanoi Val Street in which Prokofiev lived from 1936 until 1941. It’s a pretty down-to-earth place that houses, among other things, a foreign currency exchange booth, a beauty salon and a flower store. It’s one of those imposing buildings erected in the Stalin era that look like they may just last forever minus a day – rather, alas, like Stalin’s influence in Russia. Not much for the eye to look at, but not going anywhere soon. The fact that it is located on the massive and massively busy Garden Ring Road doesn’t help. The sound and air pollution is commensurate to a place besieged by automobiles night and day, 24/7. You can see the dust and/or exhaust material fairly dripping down the plaque. “In 1937 Prokofiev’s longtime friend and chess partner Sergei Radlov, a drama director, made up his mind to produce Hamlet and asked Prokofiev to write the music. ‘In a letter Radlov, whom I respect as a great authority on Shakespeare, detailed his wishes, which so reflected my own that I immediately got down to work,’ Prokofiev wrote in his diary. One will also note that the years Prokofiev spent in this building more or less coincided with what history has come to call the Great Purges. Thousands, tens-of-thousands of Prokofiev’s colleagues and peers would be arrested and disappear in the prison camps in these years. It is one of the more uncomfortable pages in Prokofiev’s biography that he wrote a handful of panegyrics to Joseph Stalin. 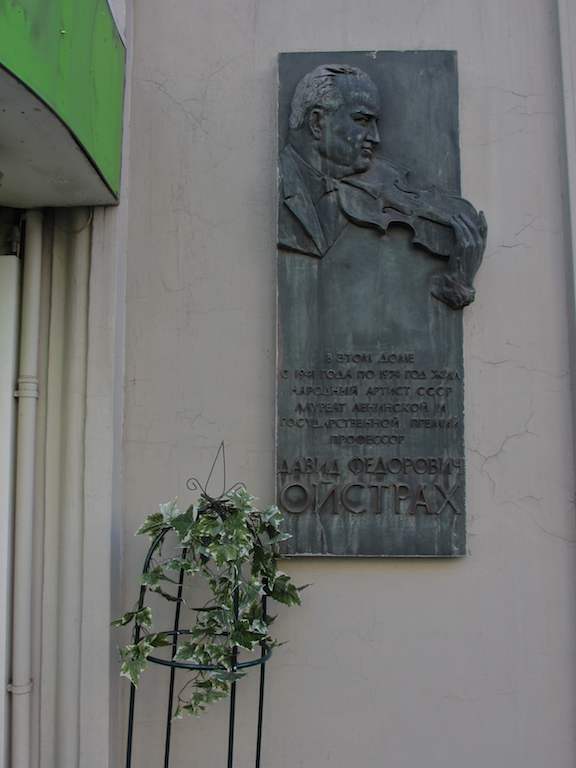 At least two were written right here – Cantata for the 20th Anniversary of the Russian Revolution (1936-37), and Zdravitsa, a cantata written on the occasion of Stalin’s 60th birthday (1939). Prokofiev was the recipient of no less than six Stalin Prizes, the highest award a Soviet civilian could receive. And then there is the curiosity of Prokofiev dying the same day as Stalin. It meant that nobody paid any attention to Prokofiev’s passing at all. Ivan Fyodorov, born between 1510 and 1530, died in 1583, the first printer/publisher in Russia. 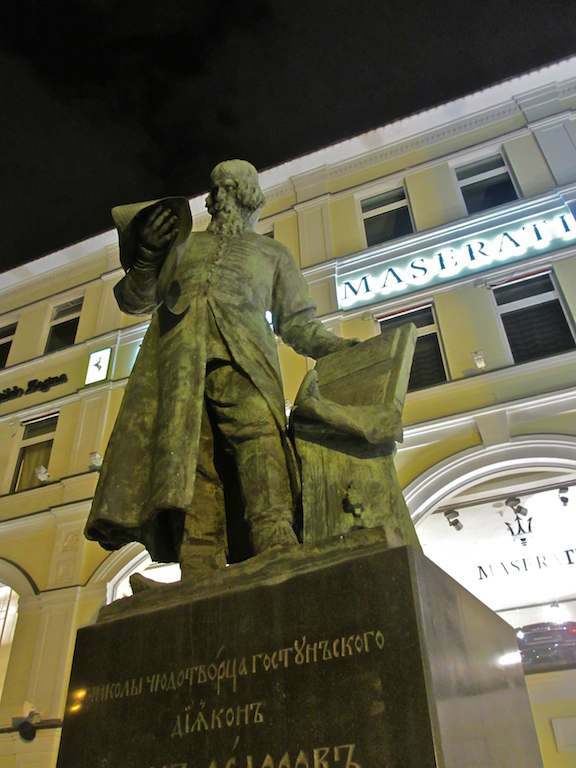 Only his name wasn’t really Ivan Fyodorov; we really don’t know when he was born; and he wasn’t the first person to print texts in Russia – or in Ukraine, where he is also often called the father of publishing. So much for the facts of history. 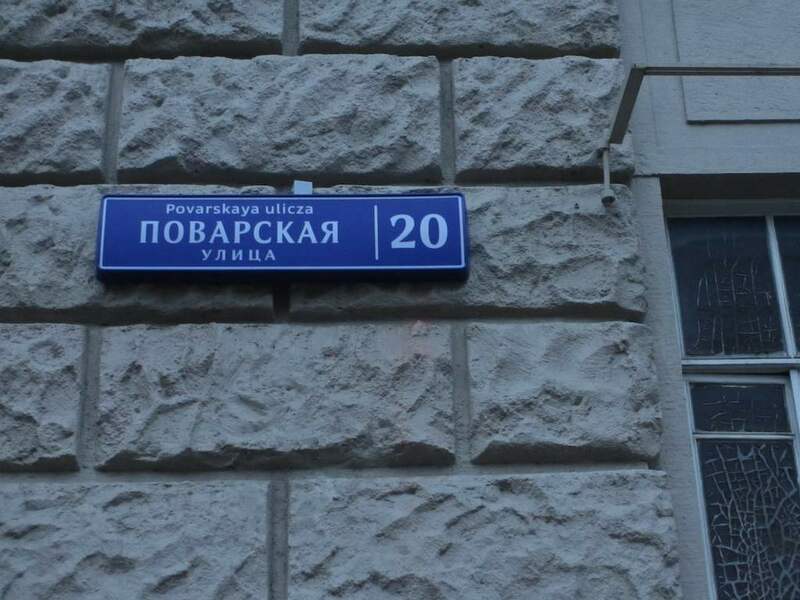 Fyodor was Ivan’s father’s name and, according to the customs of the Eastern Slavs in the 16th century, a man took his second name from his father. Sometimes Ivan used the form of Fyodorovich, the contemporary patronymic form, sometimes he called himself Ivan Fyodorovich Moskvitin, implying that he was from Moscow. Only he wasn’t originally from Moscow. 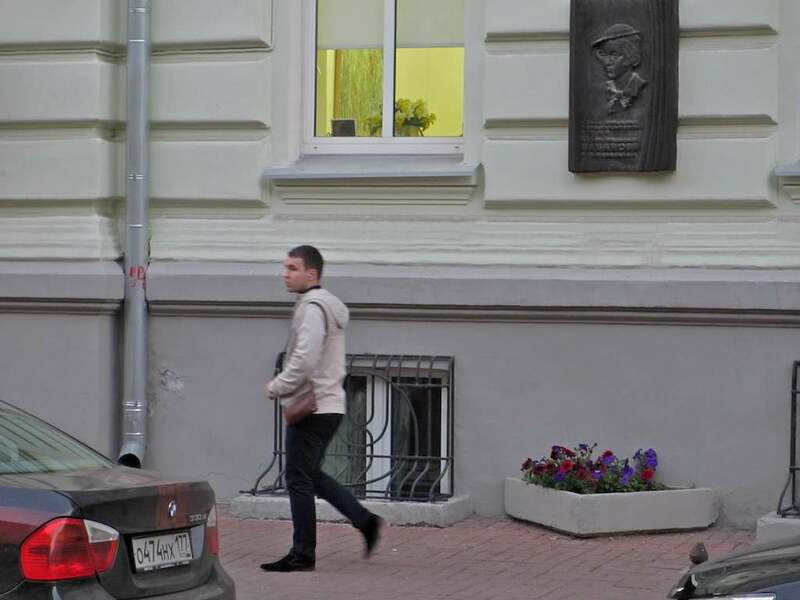 No one knows for certain, but it would appear that he came from lands that are now attached to Belarus, and he may have studied in Krakow, now belonging to Poland. Ivan Fyodorov was taught the art of bookmaking by a Dutch master brought to Moscow by Ivan the Terrible. 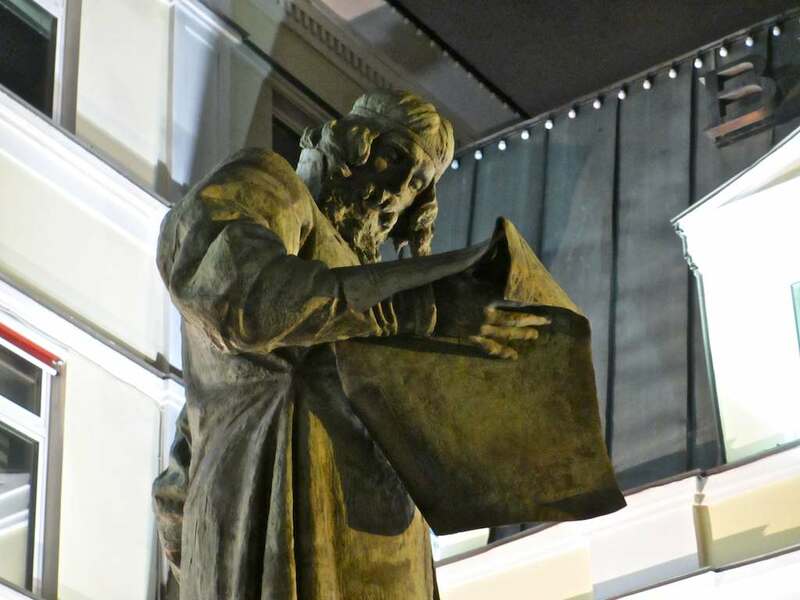 He began printing The Apostle – a combination of parts of the Gospels, and stories of the deeds and declarations of the Holy Apostles – on April 19, 1563, as is engraved on the face of this monument to the publisher in the center of Moscow. He completed printing the book on March 1, 1564. 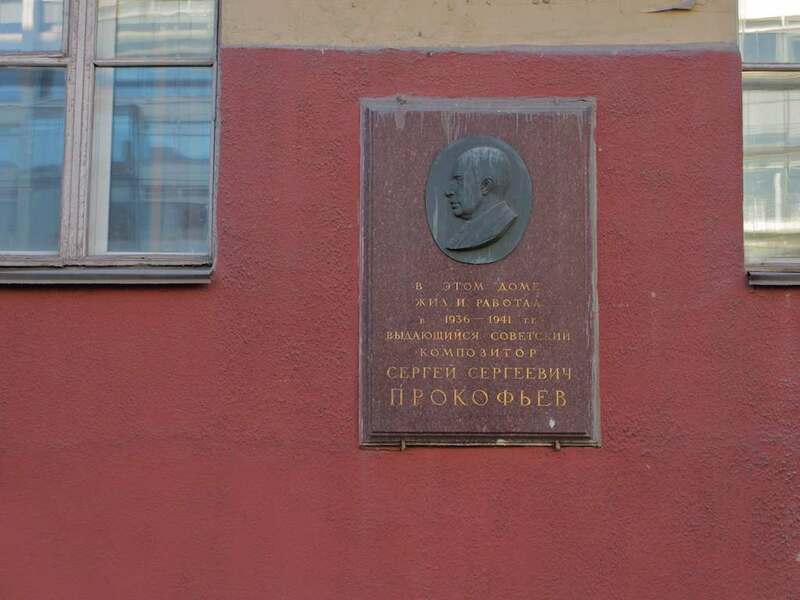 These dates are what are important in the determination of Fyodorov as the first publisher of a book in Russia. In fact there had been at least seven other books printed in Moscow by this time, but none bore dates or the names of the printer/publisher. Fyodorov set history in motion by giving us a name and dates to go with the event. It is generally considered that Fyodorov’s books are of a much higher quality than others that were printed in and around that time. Apparently Fyodorov fell out with some of his colleagues (maybe the ones who were making worse books?) 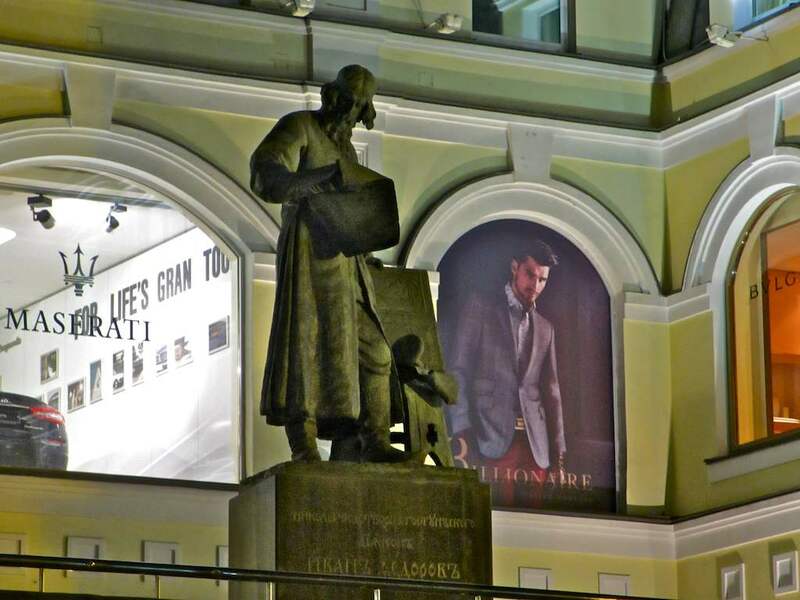 and he left Moscow with his printing partner Pyotr Mstislav in the mid-1560s for lands that are now considered Ukrainian. The monument pictured here is now located in rather spectacular surroundings. I don’t necessarily mean that in a positive sense. I just mean that there is a whole spectacle of new-Russian wealth gushing unstemmed about the bronze image of the deacon who printed pious religious texts well over 500 years ago. 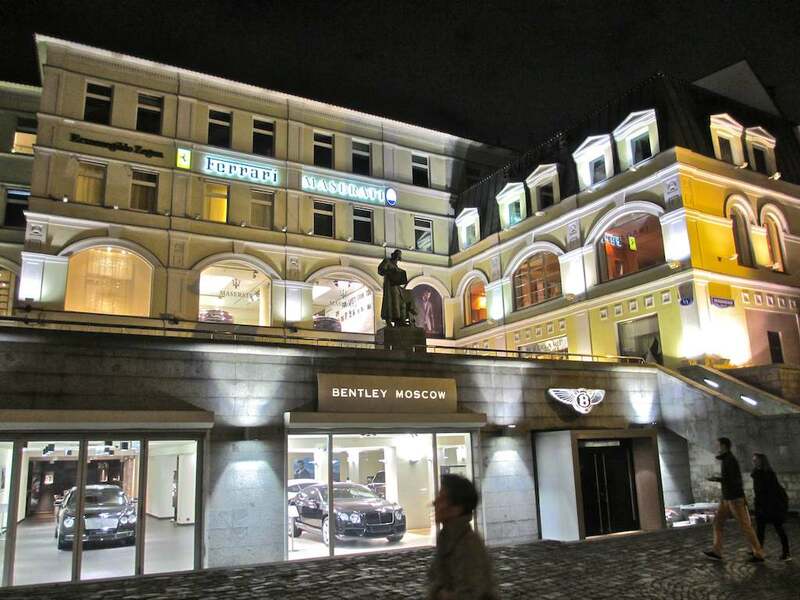 It is now cradled in the sparkle of high-rent spaces occupied, as you see, by Maserati, Ferrari, Bvlgari, Bentley and other “high-end” companies. What I find interesting is that the modest printer does not suffer all that much for the comparisons that arise. Look at the last picture below and see how well he stands up to the “Billionaire” man sulking behind him. The monument has stood in various places since it was unveiled in 1909, the work of the sculptor Sergei Volnukhin and architect Ivan Mashkov. I first saw it in more or less at this position in the late 1980s. 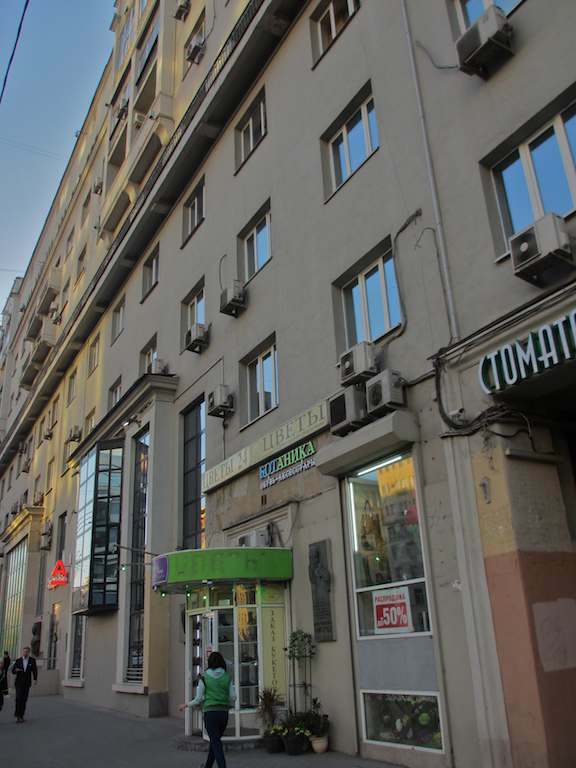 It then had a much more organic connection to its surroundings – a very nice used bookstore was located where the Ferrari showroom now stands, right behind Fyodor. (See the central photo in the trio above.) In my mind’s eye I still see that bookstore whenever I go by this location, and I still perceive all the new rich tenants as temporary usurpers. 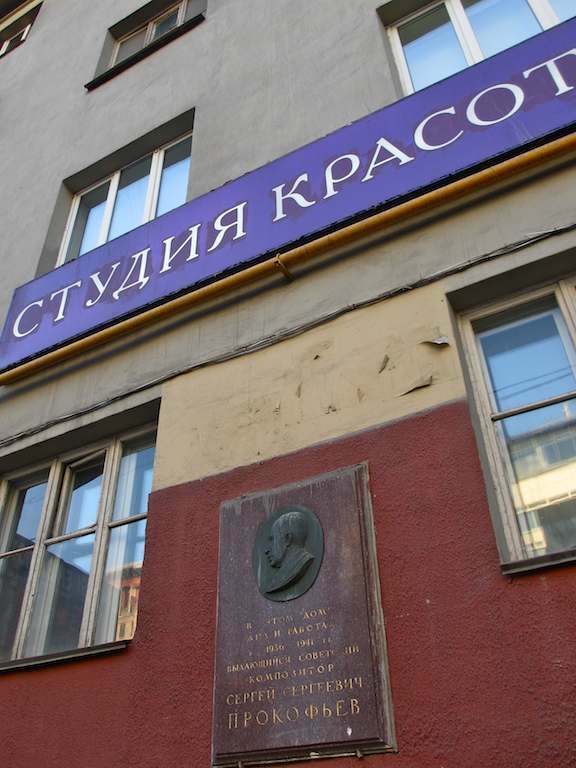 For the record, the monument stands alongside Teatralny Proezd (Theater Passageway) No. 2.